Dr. Rajan Arora has been repeatedly invited to review papers for leading journals and has chosen to serve in key editorial roles. DETROIT, MI, January 18, 2019 — Marquis Who's Who, the world's premier publisher of biographical profiles, is proud to present Rajan Arora, MD with the Albert Nelson Marquis Lifetime Achievement Award. An accomplished listee, Dr. Arora celebrates many years of experience in his professional network, and has been noted for achievements, leadership qualities, and the credentials and successes he has accrued in his field. As in all Marquis Who's Who biographical volumes, individuals profiled are selected on the basis of current reference value. Factors such as position, noteworthy accomplishments, visibility, and prominence in a field are all taken into account during the selection process. Dr. Rajan Arora is a leading expert and respected voice in the field of Pediatrics and his interests therein. He has excelled as an Assistant Professor of Pediatrics at Children's Hospital of Michigan since 2014. 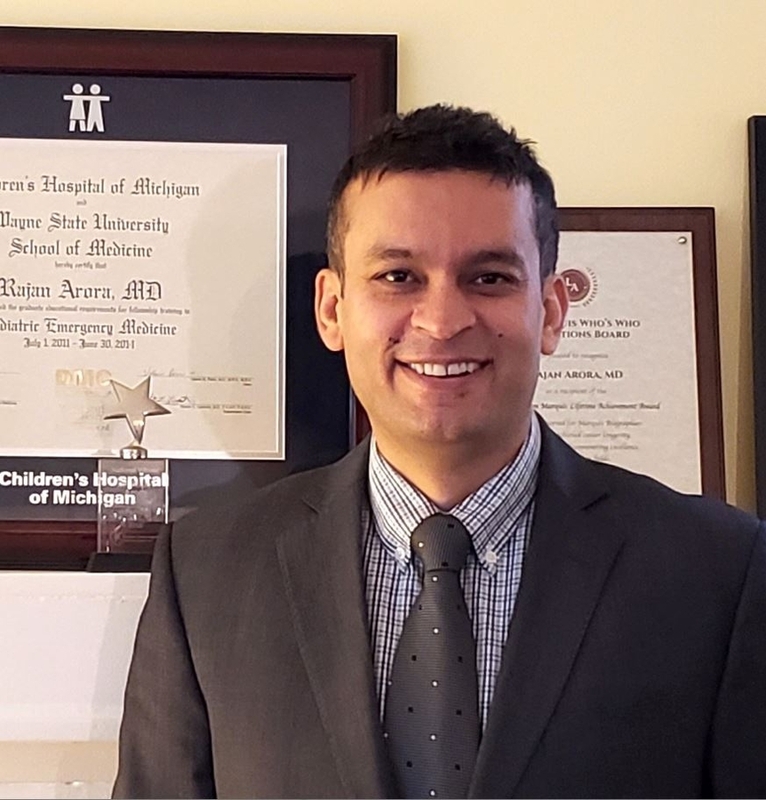 In addition to his primary responsibilities, Dr. Arora is Co-chair of the Emergency Department and Hospitalist Quality Improvement Committee at this esteemed Pediatric medical facility. Dr. Arora earned his Bachelor of Medicine and Surgery in 2002 from the University of Delhi, succeeded in 2005, with a Doctor of Medicine in Pediatrics. Relocating to the United States, he advanced in his pursuits by earning a Doctor of Medicine in Pediatrics from St. John Hospital and Medical Center in 2011. Thereafter, he pursued his studies at Wayne State University School of Medicine, becoming Chief Fellow in Pediatric Emergency Medicine from 2013 to 2014, and attaining a Doctor of Medicine in Pediatrics Emergency Medicine in 2014. Dr. Arora is a Fellow of the American Academy of Pediatrics and the American Academy of Emergency Medicine. He serves on the Executive Committee of Michigan Emergency Department Improvement Collaborative (MEDIC) – an initiative to improve the quality of Emergency care in the state of Michigan. Significantly, Dr. Arora is the site Director of Children's Hospital of Michigan's MEDIC program. Dr. Arora has contributed to the generation and dissemination of the science in his chosen field by presenting, publishing, reviewing – research, studies and manuscripts – in all manner of meetings, venues and forums. He has been repeatedly invited to review papers for leading journals and has chosen to serve in key editorial roles. Dr Arora has received numerous accolades throughout his career. Notably, to name a few, he has been presented with “Best Faculty Abstract in Pediatric Emergency Medicine” from the Society of Academic Emergency Medicine, “Physician Difference Maker” from Children's Hospital of Michigan, “Pediatric Academic Achievement” from St. John Hospital and Medical Center and “Certificate of Excellence in Research” from the SEMCME Research forum. He was also honored with “National Winner in Pediatrics” for “exceptional standing among peers” and “excellence in practice” at the Doctor's Choice Awards. In recognition of outstanding contributions to his profession and the Marquis Who's Who community, Dr. Rajan Arora has been featured on the Albert Nelson Marquis Lifetime Achievement website. Please visit www.ltachievers.com for more information about this honor.